Interior Features Ready for a closer look! 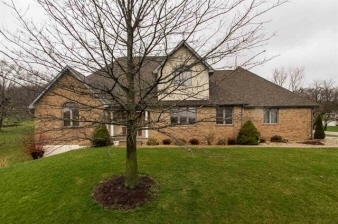 Touched by tradition, stately home in Barrington Lakes! Gracious foyer has an open staircase that leads to the upper bedrooms. Formal living and dining combination allows you the space for entertaining. Inviting living room has a full brick floor-to-ceiling fireplace. Warm and welcoming granite kitchen with counter seating, and adjacent main floor laundry. Main floor living at its best with a main floor master suite. Another bedroom or office on the main floor and two additional ample size bedrooms upstairs. The mechanicals of this home are second to none with energy efficient geothermal heating.